There’s no shortage of ways to reinvent your body. Most of us start at a young age with ear piercing and orthodontic braces. Of course, there are people who go to extremes to change their appearance for the sake of beauty. In this day and age, minor upgrades like Botox and fillers aren’t terribly sensational, and even liposuction and breast augmentation have become perfectly acceptable. We might raise an eyebrow at those who go on to get dozens of plastic surgeries until they look like a piece of molded plastic, but on the whole, our society has become pretty inured to body modification. Even tattoos, once seen as something reserved for sailors and subversives, have become par for the course in terms of beautifying our bodies. What about waist training? Where does this form of changing your appearance fall on the scale? It may depend on how devoted you are to trimming your waistline. For the average woman, waist training is a way of reducing the waist by just a few inches in order to create or enhance a feminine, hourglass shape (although there are many reasons why women waist train). There are a select few who take it a step further with tightlacing, or waist training that involves a significant reduction in waist size (more than about four inches, in general). The most famous woman to tackle tightlacing was Ethel Granger. Who is she, and how did she earn the distinction of the smallest tightlacing waist? Here’s what you should know. Ethel Granger (nee Wilson), born in 1905, would become a woman of extremes. She entered her twenties during the roaring ‘20s, when the fashion of the time threw over constrictive Victorian styles in favor of loose-fitting flapper fashion, including sack-like dresses that showed little of a woman’s shape. In 1928, when Ethel married William Granger at the age of 23, she was an average girl of the time, but under William’s ministrations, she would eventually become famous for her fashion choices, which are extreme even by today’s standards, and were practically unheard of in her time. Although she sampled other forms of body modification, including piercing, it would be her use of corsetry for the purposes of tightlacing that brought her the greatest fame. It all started when her husband, who purportedly loved the wasp-waisted look, began urging her to don a corset, along with wearing high heels and piercing her ears. She eventually relented and her journey toward tightlacing began. There’s a lot to unpack in the story of how Ethel Granger transformed from an average woman of her time to the woman she ultimately became, but the story starts with her putting on a corset to please her husband. Once she had relented to his request, he pushed her to take it further. He purchased smaller corsets to winnow her waist and requested that she wear her corset 24 hours a day, which she eventually did. 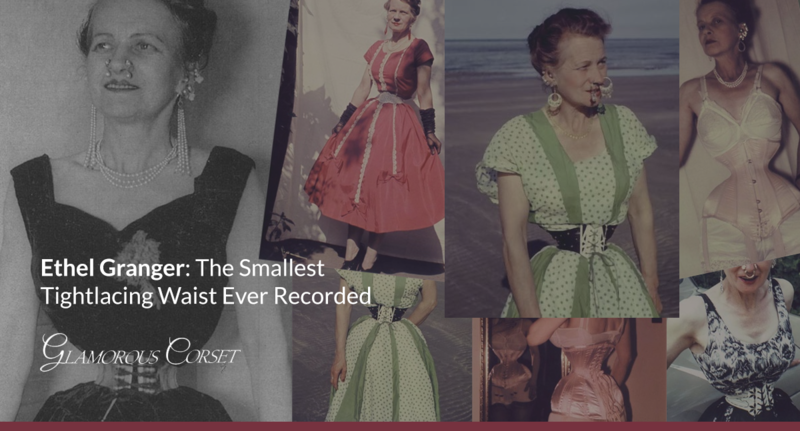 After many years of tightlacing, Ethel Granger was able to claim the world’s smallest tightlacing waist at just 13 inches, a loss of 10 inches off her natural waistline, and a distinction that landed her a spot in The Guinness Book of World Records. William also convinced her to let him pierce her ears, which he ultimately gauged up to 8mm to accommodate his custom-made earrings, and he even pierced her nostrils and her septum, although she allegedly only wore these piercings in private, for his pleasure. It’s hard to say whether Ethel went to extremes to show her love, or if William harangued and manipulated her into these body modifications. Regardless, she remains the woman with the smallest recorded waistline in history. Stay up-to-date with weekly blog posts, waist training tips, and the chance to win one of our monthly corset giveaways, like us on Facebook & subscribe to our mailing list today! Want to find the perfect steel boned corset? Shop some of our favorites: underbust corsets, overbust corsets, corset dresses. You can also shop our corsets by material: cotton corsets, denim corsets, leather corsets, mesh corsets, pvc corsets, and satin corsets. Did Victorian Women Season/Break in Their Corsets? What’s an Appropriate Waist Reduction For Me/My Waist Training?